It has been a while since my last blog but as I previously said, no point in blogging for blogging sake. Well now I have something to write about…….Zwift. I have been on Zwift for a couple of years now, I go through stages and during the 3 days that the UK has sunshine, I prefer to be out on the road. As the summer draws to a close and having tidied up the garage, after a minor water intrusion incident, an area appeared that was ideal for Zwifting. I have always used Zwift on a set of rollers, selling my original standard turbo just before I discovered the new training platform. None the less the rollers have served me well and have certainly taught me better balance. I am limited for power though, as the rollers offer little or no resistance so I top out at around 650w. Not through lack of trying but the cadence is stupidly high, the bike is highly unstable and I prefer to stay upright and not kiss the floor at an increased velocity. I have heard of the races that Zwift offer but never entered. Friends have raved about them and ZwiftCast are a strong advocator and assisted with the first e-Race held on the platform. Logging on yesterday with no set distance in mind, on the right hand side of the screen I saw a Espresso Lap Race. I thought, lets give it a go, what’s the worst that could happen? I was a little late to the party so the group had already covered 3 miles and with an issue clipping in, (felt so GCN) I was soon dropped by the main group. Clipped in and with a determined twinkle in my eye, I chased down the group. The ride leader made sure everyone knew the w/kg for sections of the ride and threaten DQ anyone shooting off the front. During lap 2 the realisation of why it was called Espresso became apparent. For those that know the Richmond course there is a sprint half way through. This would be the start of the race and it would be all out war to the finish line. As the sprint line approached the speed began to ramp up, crossing the line and boom, we were off. I managed to hold a group for the next 3 miles but maintaining 340w was taking its toll. My legs were starting to burn, sweat pouring down my face and I still had 6 miles to go. The group started to pull away and I could not hold the wheel anymore plus I wanted to ensure I crossed the finish line. Dropping down to around 260w I started to focus on others that had fallen by the wayside, to be honest there were not that many but I was concentrating on staying upright and breathing out of my arse at the same time!!! With the final climb I managed to overtake the ride leader and as the course levelled out I put the hammer down and crossed the line. It killed me but I loved the race. Uploading to Strava, I saw the full name of the ride, my first introduction to racing was a Cat A race. I had the bug so looked for another. Kiss Road Races had been setup in late 2015 by a group of dads with busy family schedules and wanted to ride or race in a group and KISS was born. These races offer the full range of categories so I decided to sign up. I did take some guidance from Ian, a hardened Zwifter on which category to start with. I decided to select CAT C and see how I got on. This morning, just before 0930 I was set and ready to go. The counter down timer was inching towards zero and I started to spin my legs. Suddenly everyone disappeared and I thought, have I started pedalling too early, have I been disqualified already? I set off down the ramp and there was no one, ‘no riders near’ listed and no one on the circuit. I thought, this is going to be hard work, no one to draft. As I began the first incline more and more riders started to appear. I was scanning the list on the right for other CAT C riders and found a group just ahead. For the next 4 laps we kept a nice steady pace and practiced drafting on Zwift. I have found with rollers it is a little slower to react when trying to take the pace off. When it came to a climb I would have to increase the wattage to keep up with those on smart turbos but as it levelled off I would then fly past. The end of the forth lap was approaching and I was not sure of the etiquette, with a mile to go no one had gone for a breakaway. We had been a considerate group. It made me think that if I go, would I upset anyone, is that not the done thing? We had exited from under the sea and still no one had gone. As we levelled out, I thought, I’m going for it, if anyone follows then fine. If I drop everyone then I will know for next time and take any punches that come my way. 3 others jumped on my wheel and I kept pushing. Four became two and I was going hell for leather then the rider behind swooped around me and crossed the line. 598w it says I was doing as I crossed the line and managed a respectable 18th in my class. The rider that beat me at the line was a CAT B rider. For a first proper attempt and considering I am on rollers that was not a bad effort, so I am told. It would be interesting to see how it will compare when fixed to a smart turbo and able to put more power down. I am hooked and will be looking for my next race. We all know the knee is an important part of movement and needs respecting and looking after. I have always been conscious of my knees, especially the right one. When I was a little younger, I used to train for MMA, this I did for 3 years but after a series of training fight, my right knee kept giving way. Every time, I acted out the final fight scene like Danny Larusso in Karate Kid, rolling around on the mat after having the knee swept by those nasty bigger boys!!! It used to make me feel physically sick and finally I paid a visit to the doctor to be checked out. This ended my fighting career, hyper-extension in the knee ligaments which resulted in 6 months of physio. From what I remember my knee cap was floating a little too much and I was told I could carry on but I would eventually end up in wheel chair. Fast forward a number of years, well to the 7th May 2017 and my final climb up Fangs Brow for the Fred Whitton Challenge. The feeling started to return and steadily got worse as the ride went on. It was a tough decision to make but I also know when to cut my losses. The knock on affect for my main job would have been disastrous and my wife would not have been too happy if I took my usual pigheaded approach. So I came to rest at the top of the climb and if you read my previous blog you will know how much this pained me. After meeting up with my fellow rider Ian, back at the start, he explained my next plan of action and all hell would break loose if I ignored him. He can be quite persuasive. A doctors appointment was booked and to cover myself I booked a sports physio appointment with Jon at Shepherds Physiotherapy. Due to the cyber attacks my appointment with the GP was cancelled and I knew the backlog of appointments would be huge, this is not a medical emergency so decided not to pursue it. I arrived at Shepherds Physiotherapy and warmly welcomed by Jon. Firstly we discussed the ride, my injury and what had happened since. I had stayed off the bike for 10 days, only once having an easy spin on the rollers. All seemed fine but you never know what is going on around the joint. He checked my knee and there was still signs of swelling. He explained that I had aggravated the suprapatellar bursa, one of the small sacks of fluid that aids in the smooth movement of the knee. There could be an underlying issue somewhere else in my body and the ride had certainly added a lot of pressure to this bursa and caused the inflammation. I was just happy there was no long lasting damage. Next he asked me to complete some simple exercises to see my range of motion, it became evident there were limitations on my right side. I was asked to lay on the table and Jon started to apply some pressure on the right side of my back. A range of muscles called the Ilopsoas in my back had become tight, he was applying pressure to release the tension. It could be an area that needs revisiting or it could all be fine after one session of poking. This man has magic hands. Once I got off the table and stopped feeling dizzy. My fault, I got up too quick, I completed the same range exercises and was now even on both sides. He provided a brief explanation of what was going on and what affect the tightness of these muscles can have on cycling and a cyclist’s power. He had now released my POWER!!!!! that must have been what has been holding me back all this time. His final words were “take it easy, it will take a few weeks for everything to settle down.” I planned to meet the rest of the Back On Track CC for a spin and if 19.5mph average over 45 miles is taking it easy then I am sorted. It is not often I get an opportunity to organise an evening ride but as it is currently half term in the south of the country, I decided to get out on the bike. 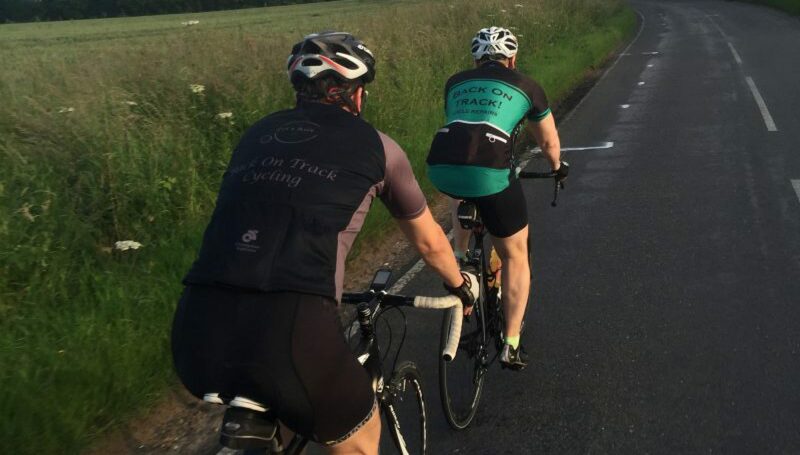 We had a few members of Back On Track Cycling, the rest were on shift, plus Dunmow Velo attended and some new faces from the local area. In total 10 fellow cyclists started to pedal the back lanes of Dunmow.